Children love to help, but it’s not always practical. The kitchen can be a dangerous place for your child even though you’re supervising. While you still let them help out with stirring the cupcake batter (and yes, you know there’s the occasional “taste” that happens when the kiddo thinks you’re not looking); or help by getting a stick of butter out of the fridge, they can’t help cook things on the stove or take items in and out of the oven no matter how badly they’d love to really help you and do that too. 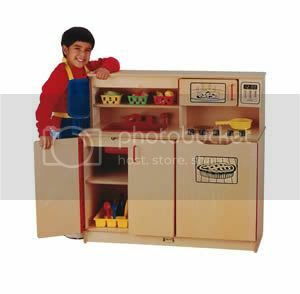 A pretend play kitchen brings a wonderful solution that can let your children have fun while also learning valuable life skills. Teach your children to “wash” their hands in the sink to get rid of any germs on their hands and explain germs can make people sick so it’s important to get rid of them before you handle foods that everyone will eat – it’s another way to instill good habits that will last a lifetime. Also, you can let them show you what they’ve learned just helping out in the kitchen with you when they play. Such as stirring their pretend batters, baking a pie or making entire pretend meals for you or their stuffed animals gathered around a table. Talk to your kids about good food choices and bad food choices. You’ll hear your words come out in their play. Afterwards, let them pretend to do the dishes (another skill you hope you can coax out of them in later years). You can even give the kids real foods to prepare such as sandwiches or encourage them to make up menus and have a restaurant. A pretend kitchen will lend itself to so many scenarios and all of them will have your kids learning something new!